Maurice Tugwell estimates that he taught Economics to about 13,000 students during his 35-year career at Acadia. Even more impressive is that within three weeks of classes starting, he knew every one of them by name. It’s no wonder that when former students mention him, the word “inspiring” often arises. “My birthday is near the end of September, and I pledged with myself that I would know every one of my students’ names by the time my birthday came around, so I could say hello to them by name,” Tugwell says. Along the way, he was awarded the Acadia Alumni Association Excellence in Teaching Award, the Acadia Students’ Union “Most Wanted” Teacher Recognition Award, and the Atlantic Universities’ Distinguished Teacher Award. 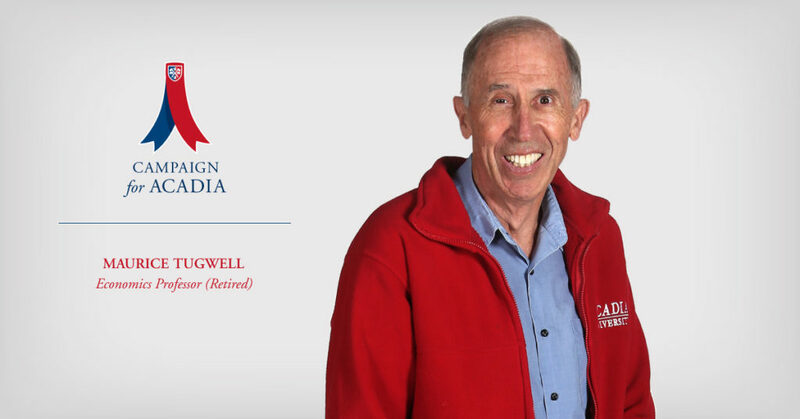 Tugwell arrived at Acadia in 1972 as a fresh-faced 25-year-old. Between then and his retirement in 2007, Acadia was his life. In February 2010, he was teaching with Class Afloat on the tall ship Concordia when it sank 500 kilometres off the coast of Brazil. After spending nearly two days in lifeboats, all 64 people on board were rescued. Today, he continues to serve his community, including as a director on the Alumni Board of Mount Allison University. Tugwell sees particular value in three kinds of donations to Acadia. First, an endowment that would enable professors to keep a few students working on projects over the summer. Second, an endowed chair in a department of the donor’s choice that would pay a professor’s salary, especially today when so many talented academics must move from one temporary position to another. Third – the kind of donation he himself has made – a contingency fund to help students in times of need. He’s thinking of those students who are engaged in what he calls “Acadia the good” – Students’ Representative Council, individuals who are staying over into the spring and not starting their summer job yet because they’re preparing for student leadership roles in the fall. Although he served in administrative roles – Economics Department Head, Assistant Dean of Arts, Acting Dean of Arts, Acting Vice-President (Academic), and University Marshall – they’re not where his heart lies. “It’s the classroom – meaning the broad sense of education – that I embrace in recollection,” he says.